We first witnessed the Xtomp in action way back at Winter NAMM 2015, but Hotone has finally unleashed the effects-loaded modelling pedal on the world. 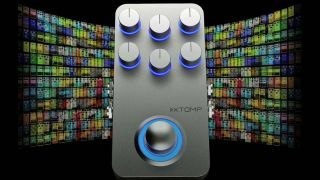 Packing over 300 guitar and bass effects that span classic, vintage and modern tones, the Xtomp utilises a iOS/Android mobile app that beams sounds to the pedal via Bluetooth. Key to the pedal's tones is its Comprehensive Dynamic Circuit Modelling tech, which processes incoming signals dynamically and allows for more complex - and therefore realistic - algorithms. Fancy. Effect types include amplifier/cabinet, distortion, dynamic, frequency, modulation, ambient, special and combo (to run multiple effects at once). In terms of connectivity, the Xtomp is packing stereo ins and outs and a USB port for firmware updates, while bypass options comprise relay-based true bypass and analogue buffered bypass. It's powered by a standard 9V power supply.